I must confess, I was a little worried about this album. ‘Cookie Jar’ was a nice song, such as ‘Peace Sign/Index Down’ but none of them could compare to the catchy awesome chorus of ‘Clothes Off!!’. But after I heard the whole album together, I realized that GCH don’t need an awesome chorus to be amazing. 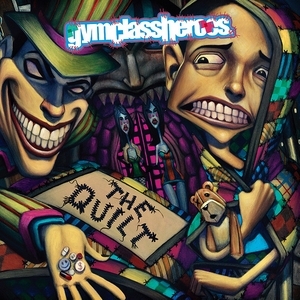 ‘The Quilt’ is the first album that deserves to have my 5 stars. It’s polished, solid an still amazing in every song. GCH put here on hell of an album worthy of a nomination for best album of 2008. ‘Guilty As Charged’ kicks of the album with a solid track, but still, one of the weakest of the albums. ‘I guess I’m guilty, ’til prove I’m innocent’ is not one very good line and it doesn’t need a God-like mind to write it. The rhythm is also a cliché and I don’t think that Estelle was a good choice… ‘Drnk Txt Rmeo’ feels like a critic to the extreme use that teenagers give to their cellphone on text messages. ‘I start texting, I keep texting, I can’t stop is my obsession’ proves that. ‘Drnk Txt Rmeo’ is one of the best songs in the album, to. ‘Peace Sign/Index Down’ is one of the songs that are nice, but really don’t standout. But I still like it. ‘Don’t let the TV mislead you, me and you are not equal, f**k you this is for my people’ tries to prove that GCH, don’t make the songs for the glamour, but for ‘their people’. ‘Like Father, Like Son (Papa’s Song)’ has the 70’s feeling and the chorus is amazing. ‘Blinded By The Sun’ takes use of the horns in an amazing way and the song is perfect for ones that are being cheated. It also counts with a nice addition with Patrick Stump’s vocals. ‘Catch Me If You Can’ has the best chorus of the album. It’s fun and it reminds the chorus on ‘Clothes Off!!’. The song in its overall is probably the best song of the album. ‘Cookie Jar’ is an amazing song when it comes to lyrics. ‘I can’t keep my hands out the cookie jar’ has a metaphor to cheating… That’s awesome, dude. The chorus and the really nice addition of The-Dream has a guest appearance make this song one of the strongest ones. ‘Live A Little’ made me look to the box twice and to iTunes to see if I didn’t got to play the wrong song. It doesn’t seem them playing because of the GCH vocals of the guitarist and the song seems of a rock band. Still, it’s a very good track. ‘Don’t Tell Me It’s Over’… I don’t like or dislike… It seems a cliché but it’s still a nice track. ‘Live Forever (Fly With Me)’ is a nice track, but really nothing more to say. It’s good. ‘Kissin’ Ears’ is one of the best songs on this album to. It has an R&B feeling but still it’s amazing how everything comes together. ‘Home’ starts with a guitar intro and it comes well when it turns into a rap song. It’s also one of the best in the album. ‘No Place To Run’ is what every album has… Yes, I’m talking about the filler… Now a days, there aren’t any ‘All Killer, No Filler’ albums… ‘Coming Clean’ ends the album in a nice way. GCH put here on hell of an album and prove that they aren’t just another group. ‘The Quilt’ is infectious, solid and catchy in it’s one way. It may be a little mainstream for the ones that hear ‘The Papercut Chronicles’ but if you’re looking to add an album to your collection of ‘Greatest Albums Of All Time’, then, this is the one.